Things have been very quiet lately on this blog haven’t they? The end of summer has felt very busy around here. I’m also getting ready for my mother-in-law’s visit later this week. The piles of laundry are ridiculous. really, they are. But we’re working on it. 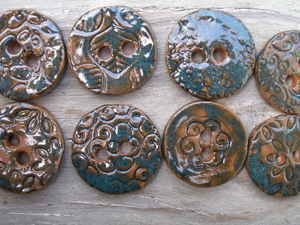 I got my first batch of buttons and pendants back from my work with the workshop program at the community college. There is definitely a learning curve involved–finding new clay, new glazes, new kiln…So this batch turned out a little differently from my past work. I’m still pleased with some of it, but I did have to put a disappointingly large pile of things (almost all my owl buttons. boo!) in the "seconds bowl". I’m not sure what I’ll do with them. For now they are serving as currency for Mary and Emma’s ‘grocery store’. The clay this time was a little bit redder and lighter so everything has a different feel, at least to me. 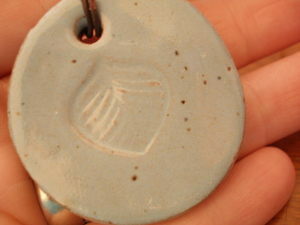 This was the first time I worked with some imprints on my buttons and pendants. This set has a blue green wash of color over the print. They look extrememly shiny in this picture. Some of that is the sun, but they are a little glassy. 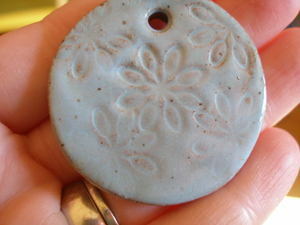 And a few pendants came out nicely, too. They remind me of robin’s eggs–the blue color flecked with specks of brown. These and others will be up in my etsy shop sometime this week. As always, if you are on my mailing list, you’ll get the heads up first. Off to change that laundry…..we’re making progress, we’re making progress…..
oh, do i love that dark chocolately brown and robin’s egg blue? yes. yes i do. i think these all look great molly! way to go, i mean if this is the learning curve i cant imagine what things will look like when you are rockin’ it! ugh laundry…yes, dont even remind me. good luck with all that needs to be done between now and school! They’re all pretty! I especially like the flower pendant! Love the new buttons. And the pendants are so beautiful! Love your unique style! as always – so gorgeous!!! The robin’s egg ones are particularly stunning…. everything looks beautiful!ahhh, the days when grocery shopping was fun! 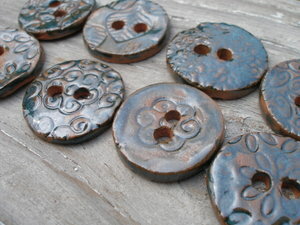 love the buttons and the pendants – they look so luminous. for me it is the piles of folded laundry that need putting away today. Let me tell ya – the laundry never ends!!! But you’ve done some great work there – and even the work you’re not 100% happy with is being put to good use in the ‘grocery store’. How fab! Those look beautiful Molly…things have been a little quiet around my blog lately too. Having too much fun in our “real” lives I guess. I agree about busy end of summer for sure! 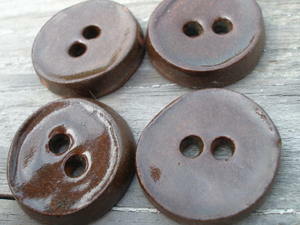 I think the buttons turned out so nicely and the pendants are gorgeous! I love the simplicity of the patterns and the color is perfect. Bonjour Molly 🙂 I hope you’re fine ?! I love your new creations ! You’re such a talented fairy 🙂 I’m still waiting for the Belgian Post if you see what I mean LOL I guess maybe it will arrive for Christmas 🙂 And I suppose you didn’t get your book either ?? I’m so dissapointed and feel sorry for you ! Enormous hugs ! Oh I LOVE the last photo of the leaf imprint…I’ll have to keep an eye out for more of those at your shop. By the way….I LOVE my pendant that I purchased last month…awesome job! Oh, how lovely and summery! beautiful, all of it! don’t feel to bad about the laundry…I hung a load up on the line before the wedding and it’s still hanging there!! That was a week ago. dearie me. Oh I want to buy the blue one! Am I on the list?